I am new to this. Way too new. This is my first ever Favorites post and honestly, I don’t really know what to do. Are you meant to post this at the beginning of a new month? if so I have succeeded. I love reading these kind of posts and watching them on YouTube so, I know what i’m meant to include, I just didn’t think I would have quite so much stuff. The thing is my favorites aren’t just limited to beauty, I have a whole range of favorites from the month of February so, I hope you enjoy! My February favorites are in some kind of order, so just bear with! I’ll also include all of the links to the products when I can so you can check them out! This perfume from Zara was a present I got for Christmas it came with another perfume (White) but, this one is just a huge surprise. It doesn’t look like it should smell great being called ‘Turqouise Green‘ but, holy moly it smells good. I have been wearing it virtually everyday in February so, shout to Zara. Face Wipes – Yes, I know how boring. I included them because I’ve been using them for months, face wipes usually irritate my skin and break me out but, these are so gentle and lovely and I love them. 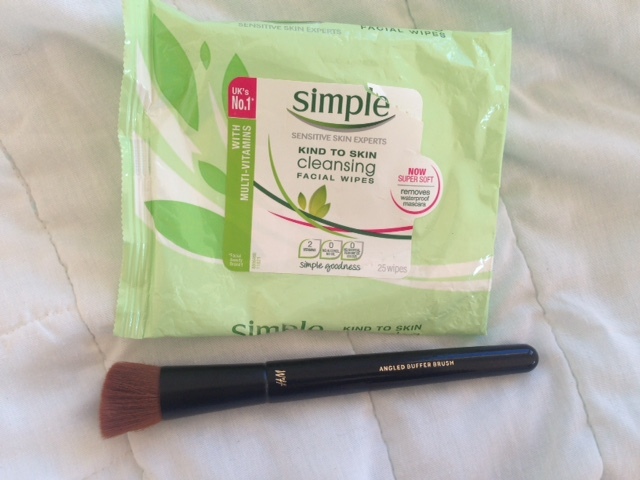 Buffer Brush – My buffer brush is from H &M. It was bought on a total whim. I wanted something to blend my contour and this does the job, I use it virtually every day and it deserves to be here, okay? These two lip balms came in a set I talked about at Christmas. You can see that here. It contained 5 different flavors and out of all them these are the two I constantly have with me. They are so refreshing and feel so good on dry lips. 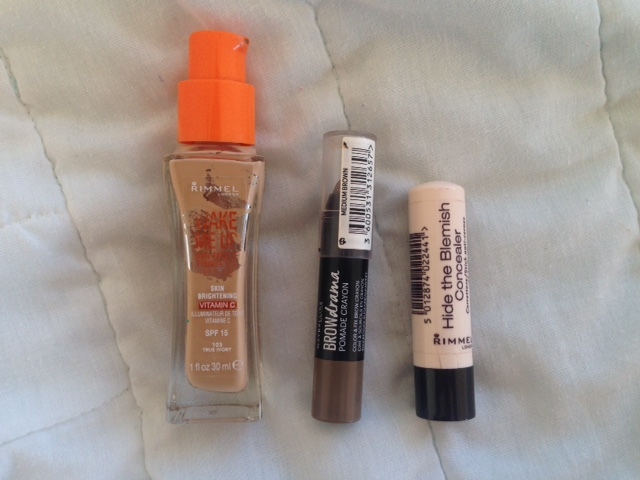 Foundation – I have been wearing Rimmel wake me up for about 2 years, it’s my go to foundation. I have used others and I do own others but this is just my every day foundation. It will take a lot for this bad boy not to be on my face 24/7. Brow Drama – The brow drama was a gift from my mum. She picked it up not knowing what it was for me to try (so cute, I know). I didn’t really know what to make of it considering how difficult it looks to use but, I use it to fill the middle of my brows everyday and I love it!! It’s so nice and really compliments my eyebrows, massive fav. Concealer – I have been wearing this concealer for about two years now and never looked back. It’s my absolute favorite in the world and although Rimmel keep changing the packaging I will forever be loyal. Soap & Glory will forever be my bae and this month has been no exception. I got this huge wheel full of all different Soap & Glory Body Lotions for Christmas ( you can read about it here) and these two beauties happened to be inside and they just so happen to be my absolute favorites. I finally got myself some coconut oil a few days ago (so it does still count as a February favorite!) I’ve been using it every night on my lips and nails and I am not even joking my nails have become so much stronger and my lips are like soft little babies. Nivea soft has been my go to moisturizer for…ever. I love it, it’s so cheap it works well with my skin and lasts for ages. This Clean and Clear spot cream was bought because I had a major spot issue over Christmas and it really cleared them up. I dab a small amount on every time I get a spot and it just goes or reduces massively overnight. The AEOS hydrating mist was sent to me by AEOS in a kit. I wrote about it here. I do still use the kit but, the hydrating mist is just my favorite, I use it all the time and it really just helps my skin look alive. The Anubis cleansing mousse was inside my dollibox (You can read about that here) I love love love love love it. It makes me skin feel sooooooooo clean. I dragged my boyfriend shopping at the weekend and in panic of having to buy something or he would complain that we came here for nothing, I stumbled (well, less stumbled and more frantically found) this jumper in the sale section of H&M. I had previously seen it before and almost bought for full price a few months back but, luckily I scored it for 5 euros. Yes 5. My Favorite book of February was between this and one other but, in the end I opted for Marian Keyes. I am a die hard fan and should I meet her someday she will always know I picked her book over another. My banana pencil case is so cute don’t even deny it. I keep all of my pens in here (duh what else would I be keeping in pencil case?) it’s so squishy and I just love it. I was not a fan of multivitamins. I didn’t believe they worked but, since I bit the bullet and decided to invest I have had less headaches, less dizzy spells and a lot more energy. So I was wrong and I am now hooked. You may or may not know I am a clean freak when it comes down to germs, I must wash my hands a million times a day so, having this huge bottle of hand sanitiser with me at all times just helps me out. 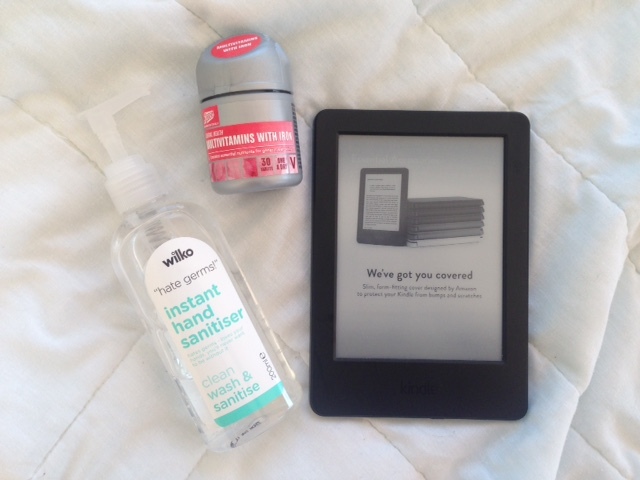 My kindle I got for Christmas from my boyfriend and although I said I wouldn’t get on it with because I am a ‘books are meant to be smelt and felt’ kinda person, it’s amazing. It doesn’t drop on my head, my hands don’t get tired, it’s so easy to read and download books on to so…yeah I am now a kindle person. My nail art favs! I mention these in every single nail art post but they are seriously my favorite things ever. They have helped me so much with my nails and have given me the ability to create amazing designs. Some little extras I forgot to include are below! You can read all about them by clicking here! Absolutely anything ( no really that’s what it’s called!) It has Simon Pegg in it and its just fantastic. I absolutely loved it. I hope you enjoyed my February favorites, if you did please let me know in the comments below and also let me know what your February favorite was!